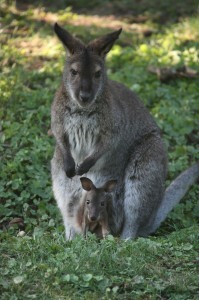 The single tiny young wallaby, born after a gestation period of only 30 days, weighs less than 1/30 of an ounce. It is about the size of a raisin. At birth, the tongue, nostrils, forelimbs, and digits are well developed. The baby wallaby crawls to the mother’s pouch, without any assistance from her, where it will stay for five months. It probably finds its way by sense of smell. We have four red-necked wallabies (Macropus rufogriseus) at Scovill Zoo. You can find them near the train depot. In the wild, wallabies eat grass, fruit, and seeds. Here at the zoo, they eat dry food in the morning, followed by grass during the day, and vegetables in the afternoon.